Developed by design professionals, Autodesk® Revit® workFlow adds powerful and practical daily use tools designed to turbo charge your Autodesk Revit productivity. Reference views in parameter values, text notes, and keynotes (requires Keynote Manager) and have them automatically update when the view changes. Align similar views from one sheet to the next with a click of a button. Place reference views by sheet and detail number rather than searching through a large list of views. Set an office standard for view naming and update view names with 1 click. Create finish floors based on the finish schedule with a single click or for the whole project at once. QC check dimension plans for undimensioned elements. Override dimensions with override standards in bulk. To start a free 30-day trial, simply install the app and start, your trial will begin automatically! Great App with Great Support! This add-in is easy to use and helps improve the production of drawings for any firm. Easy to use and functional. Great programs to speed up production. 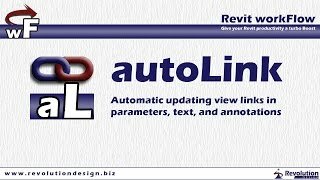 Autolink links your details in notes and door schedule which helps to reduce errors. It takes your Revit to a new level.